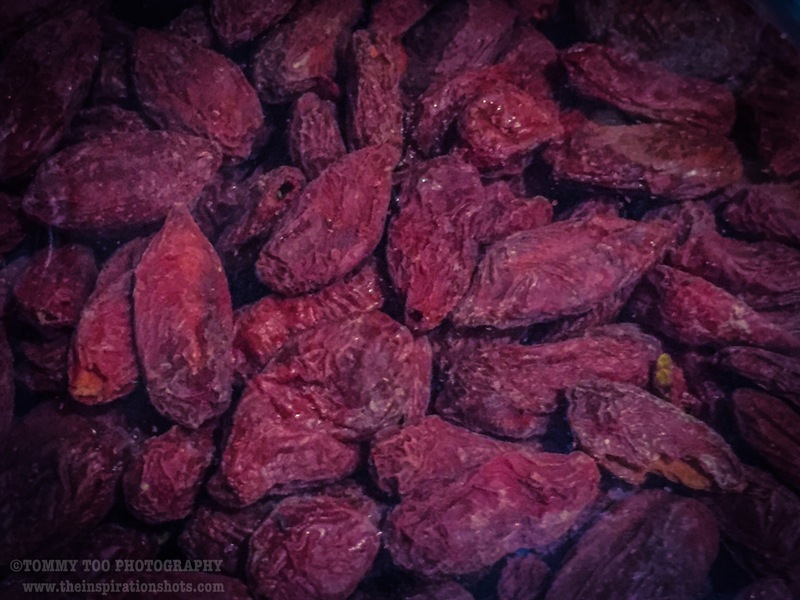 Goji, goji berry or wolfberry is the fruit of Lycium barbarum (simplified Chinese: 宁夏枸杞; traditional Chinese: 寧夏枸杞; pinyin: Níngxià gǒuqǐ) and Lycium Chinense (pinyin: gǒuqǐ), two closely related species of box thorn in the nightshade family, Solanaceae. The family also includes the potato, tomato, eggplant, belladonna, chili pepper, and tobacco. The two species are native to Asia. Wolfberry species are deciduous woody perennial plants, growing 1–3 m high. L. chinense is grown in the south of China and tends to be somewhat shorter, while L. barbarum is grown in the north, primarily in the Ningxia Hui Autonomous Region, and tends to be somewhat taller. Wolfberry leaves form on the shoot either in an alternating arrangement or in bundles of up to three, each having either a lanceolate (shaped like a spearhead longer than it is wide) or ovate (egg-like) shape. Leaf dimensions are 7.0 cm long by 3.5 cm broad with blunted or rounded tips. The flowers grow in groups of one to three in the leaf axils. The calyx (eventually ruptured by the growing berry) consists of bell-shaped or tubular sepals forming short, triangular lobes. The corollae are lavender or light purple, 9–14 mm wide with five or six lobes shorter than the tube. The stamens are structured with filaments longer than the anthers. The anthers are longitudinally dehiscent. In the Northern Hemisphere, flowering occurs from June through September and berry maturation from August to October, depending on the latitude, altitude, and climate. These species produce a bright orange-red, ellipsoid berry 1–2 cm in diameter. The number of seeds in each berry varies widely based on cultivar and fruit size, containing 10–60 tiny yellow seeds that are compressed with a curved embryo. The berries ripen from July to October in the Northern Hemisphere. Lycium, the genus name, is derived from the ancient southern Anatolian region of Lycia (Λυκία). The fruit is known in pharmacological references as Lycii fructus, which is Latin for “Lycium fruit”. “Wolfberry”, a commonly used English name, has unknown origin, perhaps resulting from the Mandarin root, gou, meaning dog or confusion over the genus name, Lycium, which resembles lycos, the Greek word for wolf. In the English-speaking world, the name “goji berry” has been used since the early 21st century. The word “goji” is an approximation of the pronunciation of gǒuqǐ, the name for L. chinense in several Chinese dialects, including Hokkien and Shanghainese.